It started out as an apple pie – classic and simple. Then I added cranberries, followed by orange zest and spices. Before I could stop myself, a festive deep dish apple cranberry pie had been created. It turns out it’s a great way to use up those extra cranberries from Thanksgiving while creating a dessert fit for the next holiday party. Like a few other recipes I’m working on for the holiday season, this is not from the Paula Peck archives. The cream cheese pie crust recipe is from the cookbook, “John Clancy’s Favorite Recipes” by John Clancy, a chef and friend of my grandmother from the same 1970’s + era. With just his name scribbled across a few of my grandmother’s unpublished recipes, I know little about John Clancy. I’ve heard that his strength was baking more so than cooking, and I assume he met my grandmother through James Beard, with whom he taught cooking classes. In addition to a handful of cookbooks and his work as a teacher, he was also a restaurateur- owning a successful restaurant in Greenwich Village. Since the original cream cheese pastry recipe is for one 9-inch shell, I doubled it to fit this double crusted pie. For those of you concerned about the additional dairy and fat from the cream cheese, my grandmother’s rich tart pastry would also work well (not that it’s anymore diet friendly though). 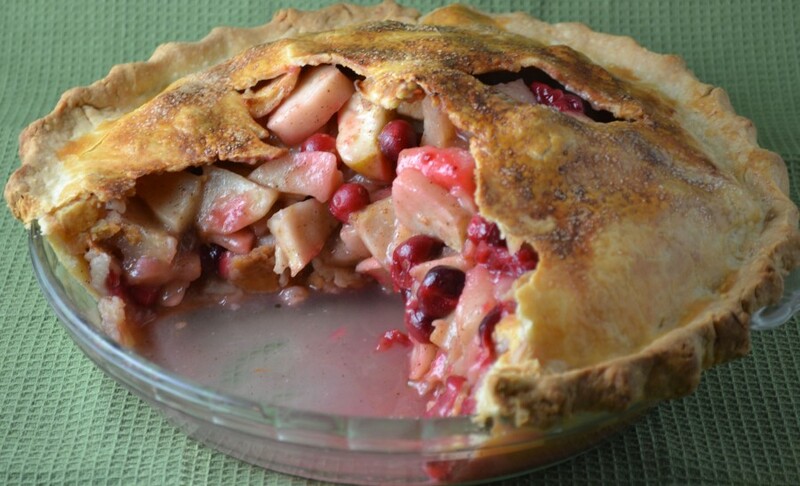 The pastry crust creates a fragile shell around the filling which is jam packed with tender apples and juicy cranberries that are liberally sweetened to balance the tartness of the fruit. Spiced with cinnamon and just a pinch cloves and nutmeg, this apple cranberry pie will fill your home with the sweet aroma of the holidays. Combine the flour, salt, and sugar with an electric mixer. Add butter and cream cheese and mix on medium speed until the ingredients are well blended. Form dough into a disk and chill 30 minutes. Cut disk in half and roll out half the dough into a round about 1/8 inch thick (chill remaining half until ready to use). Transfer dough to a 9-inch pie plate. Press the dough against the sides and bottom and trim edges, leaving a 1/2 inch overhang. Chill the pie shell for 30 minutes. Peel and slice apples 1/4 inch thick. Rub apples with half of a lemon to stop them from browning while you slice them. In a large bowl, combine the apples with the cranberries, sugar, orange zest, spices, and flour. Roll out remaining pastry into a large round about 1/8 inch thick. Transfer filling into chilled pie shell and dot with butter. Roll the pastry onto a rolling pin and unroll over filling. Trim edges and pinch together top pastry with the overhang from the pastry shell. Chill pie for 15 minutes. Preheat oven to 400 degrees. Brush the pie with a little milk and sprinkle with sugar. Cut 4-5 steam vents (about 2 inches long). Bake 40 min – 1 hour or until apples are tender when a toothpick or cake tester is inserted into the pie. Cream Cheese Pastry recipe adapted from “John Clancy’s Favorite Recipes,” by John Clancy.